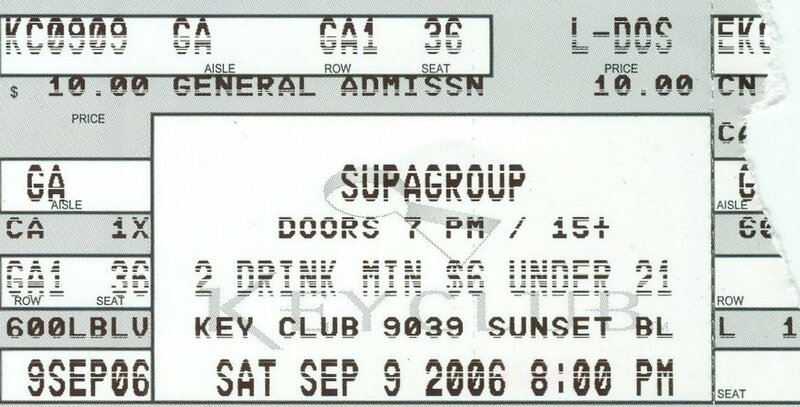 We had a family outing to see Supagroup last night at the Keyclub in W. Hollywood. Jacki had gotten her hair done earlier in the day and what better place to show it off than Hollywood. In our traditional fashion of not planning we decided around 8pm to goto a show with a 7pm start time. We saw 4 bands on the bill: Vayden, Prima Donna, The Giraffes, and Supagroup. First off I must say the Keyclub is an awesome venue. Great sound, clean, nice interiors, and the video screens are a nice touch. Vayden, the first band, even commented on how they don't have clubs that nice from where they are from. Vayden was the surprise of the evening. A metal band with a modern production value. Their drummer was amazing and it was great to hear a metal singer that could actually sing. We picked up their cd afterwards. Many of the progressive metal drumming aspects, songs were fairly simple in structure, and many had the modern rhythms of say the Killers crossed with Disturbed. Sounds weird but came off great. They had by far the largest crowd of the evening. Second up was Prima Donna. Think Hanoi Rocks and New York Dolls. A young group of guys glammed out and playing songs with a very 70s sound. They played a glammed version of an Eddie Cochran song Led Zeppelin covered called Somethin' Else. Nice to hear an obscure cover. Darian really liked this so we ended up getting both their cd and Vayden's. Next was The Giraffes. Although the singer was entertaining I am going to have to stick with if you can't say anything nice then you shouldn't say anything at all. I definitely didn't get it. And then to top it off towards the end of their set their guitar player drops his pants for all the world to see and proceeds to play. About 2 minutes security came up and looked as though they were going to kick him out. He pulled his pants back up and they finished with no incident. Last but not least was Supagroup. Jacki and Darian weren't sure they wanted to go but I promised them they'd have a good time and Supagroup delivered. Playing to the small crowd as if were an arena of 10,000 their band name did not disappoint. They played a little over an hour and we got to talk to the band after the set. Chris Lee made a comment from the stage that they knew nearly everyone in the audience, so we told him afterwards we didn't know him. He laughed and then asked very seriously, so why are you here? I explained I had been a fan for a few years and saw them about 2 years ago in Atlanta. We got the setlist, a drum stick, guitar pick and Darian even got a picture with Benji Lee their lead guitarist. If you haven't heard of this band, go and check them out. They have two great cds and put on a fun live show. You will not be disappointed. We wrapped the night at Mel's for a late night breakfast. Driving back home on Sunset we drove back by the club and saw the singer and drummer from The Giraffes walking through the cross walk. Jacki unrolled her window and yelled, "Hey Giraffe guy", and they ran over and hi-fived her. Very fun, and made us from going "boo giraffes" just moments before to having them cap off a great night. More pics can found on my picasaweb site.